"This year the community awarded Sacchetti Construction the 2012 People's Choice Award for their property located in Ocean Ridge. The People's Choice Award was voted on by the public through social media." 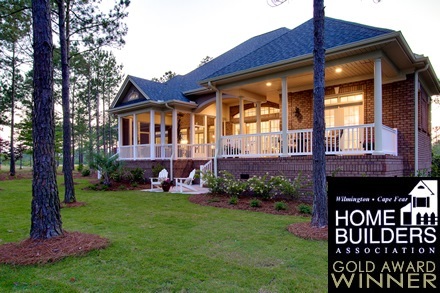 Wilmington's Award Winning Custom Home Builder! Sacchetti Construction Corporation creates excellent custom homes in Brunswick, New Hanover and Pender Counties in southeastern North Carolina. See what our previous customers say about us, tour a photo gallery of our beautiful work and then decide if you are ready for us to build the dream home that's right for you. Congratulations to Jules Sacchetti for his recent appointment to the Board of Directors for the Wilmington/Cape Fear Home Builders Associations! 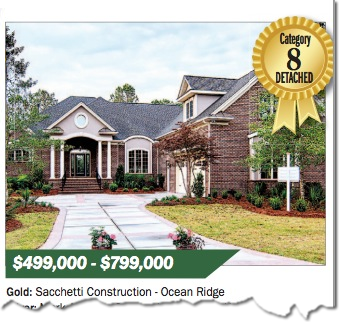 Sacchetti Construction Corporation took home the top honors again in 2012's Parade of Homes competition, earning the Gold Award and the praise of peers and competitors alike! 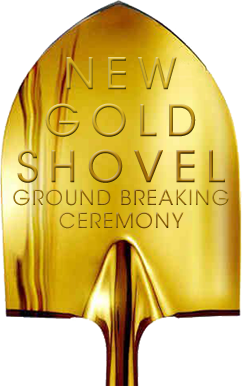 In addition to being the first company to win the Gold Award two years in a row, Sacchetti Construction Corporation also took home the People's Choice Award! Click here to see photographs of the winning house! Check Out Our Business Profile Feature in the North Brunswick Magazine! If you are looking for a builder that will listen to you, work with you, and build a home that you will love, give us a call at 910.367.6840 or fill out our Contact Form. We will be happy to help in any way we can. Sacchetti Construction Corporation was rated at the highest level for client satisfaction by the Houzz community.